Clay RollerThis handy, portable roller is ideal for working with polymer clay at home or while traveling. It is an 8" solid acrylic rod designed to help condition polymer clay, roll out sheets, and smooth clay surfaces. It has a non-stick surface that wipes clean with alcohol for easy clean-up. 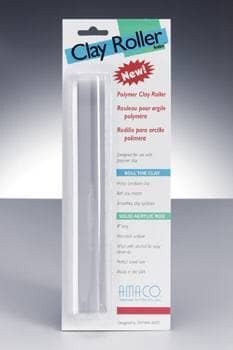 Write A Review For Clay Roller Solid Acrylic 8"